Benson was admitted to Ochsner Hospital in mid-February with flu-like symptoms that multiple sources said included a bout with pneumonia. He was moved to the intensive care unit days later and remained there until the time of his death. Benson’s condition appeared to be improving in late February, according to a report issued by team officials, but his health took a downturn in recent days. The New Orleans Saints said they wanted Drew Brees to remain a New Orleans Saint. Drew Brees will remain, and likely will finish his Hall of Fame career, as a New Orleans Saint. Brees, the best player in franchise history, and the Saints agreed to a two-year contract Tuesday that will push Brees to 19 NFL seasons, 14 with the Saints. During the next two years, among the NFL records within Brees’ reach is passing yards (he has 70,445; Peyton Manning’s record is 71,940) and touchdown passes (Brees sits at 488; Manning’s record is 539). “I think that provides, certainly, the team with the most flexibility when it comes to being able to anticipate the future and the ability to acquire free agents and re-sign players on our existing roster that will build a championship team,” Brees told ESPN. 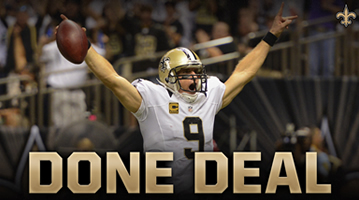 Posted in Saints News | Comments Off on Deal is done ! INDIANAPOLIS — The New Orleans Saints had an incredible 2017 draft class, and as the process played out, coach Sean Payton was surprised how the board fell in their favor. Before the draft, Payton thought the 42nd overall pick in the second round would be a good spot to pick Tennessee running back Alvin Kamara. The expectation that Kamara or other talented players would be available was a reason the Saints didn’t want to trade the second-round pick away, perhaps in a potential Malcolm Butler deal. However, when the Saints were on the clock, another player they’d given a first-round grade was still available, Utah safety Marcus Williams.